Delivering lightweight strength for alpine adventures, the Komperdell Ascent Carbon Tour trekking poles help you forge your way up steep slopes and down winding, technical descents. Climb up steep slopes and navigate gnarly backcountry descents with the help of the Komperdell Ascent Carbon Tour trekking poles, delivering lightweight strength for mountain adventures. Perfect for all of your hiking and backpacking adventures, the compact and lightweight Komperdell Carbon Approach Vario 3 trekking poles feature an innovative and convenient 3-section folding design. 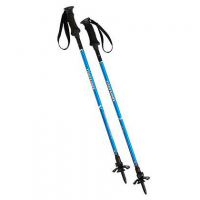 Conquer steep climbs and rocky descents with the Komperdell Peak Blue trekking poles. Their durable, adjustable design keeps you comfortable and steady while you take on the trails. Classic, comfortable and dependable, the Komperdell Peak Cork trekking poles keep you steady and help balance your load on challenging day hikes and weekend backpacking trips alike. Reduce strain on your knees and ankles on tough terrain with the Komperdell Peakmaster Powerlock Cork comp trekking poles made from solid, robust alloy. Made of solid and robust alloy, the Komperdell Peakmaster Powerlock Cork trekking poles help reduce strain on your knees and ankles, making them great for hikes. Conquer the trails with the streamlined, light and comfortable Komperdell Ridgemaster Powerlock trekking poles. Their 1-click locking mechanisms make adjustments fast and secure. Komperdell Summit Carbon Power Lock Comp trekking poles offer control and assistance while you hike.